This all wood yo-yo was made by Hummingbird and sold at the 1994 National Yo-Yo Championship in Chico, California. 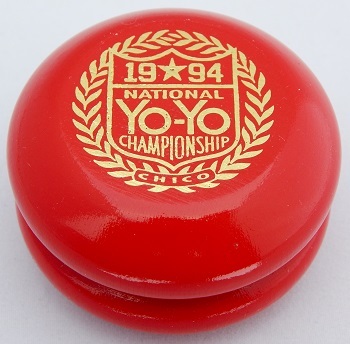 One side of the yo-yo was stamped with the "Bird in Hand" store logo (they were one of the sponsors of the contest), while and the other side was stamped with the "1994 National Yo-Yo Championship" crest, surrounded by a wreath of laurel leaves, and "Chico" below the crest. 1994 was the second year that the National Yo-Yo Championship was held. Also, to my knowledge, a "1995 National Yo-Yo Championship" yo-yo was never released by Hummingbird, even though the contest took place. 1995 was the year Hummingbird went out of business, but returned in 1996 reincarnated as BC/What's Next.